Not just for genes, the PiggyBac system is also an excellent choice for reliably producing shRNA. 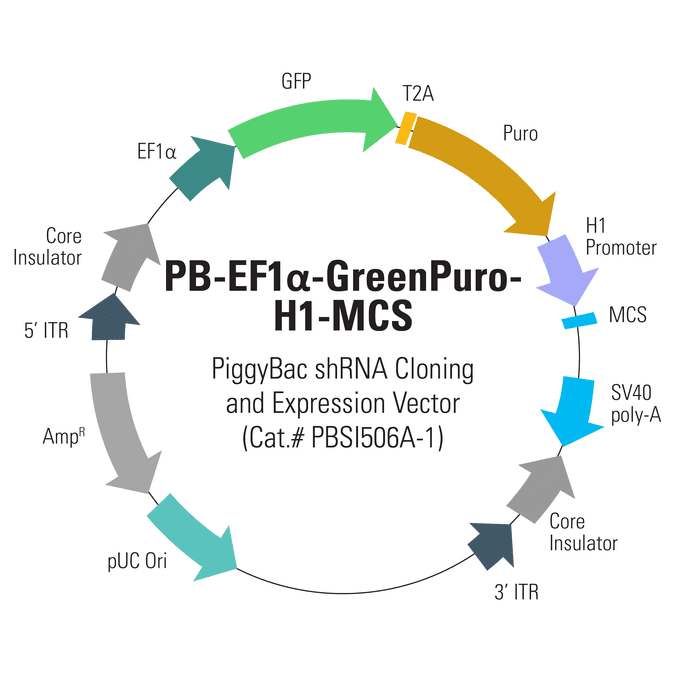 The PB-EF1α-GreenPuro-H1-MCS shRNA Cloning and Expression Vector (Cat.# PBSI506A-1) drives production of your shRNA from the strong H1 promoter. The vector also features GFP and puromycin resistance co-expressed from the moderate EF1α promoter, with co-expression mediated by the T2A element. Academic customers can purchase PiggyBac Transposon System components for internal research purposes for indefinite use, whereas commercial customers must sign a customer agreement for a six-month, limited-use license to test the technology. * SBI is fully licensed to distribute PiggyBac vectors as a partnership with Transposagen Biopharmaceuticals, Inc. The efficient PiggyBac Transposon System uses a cut-and-paste mechanism to transfer DNA from the PiggyBac Vector into the genome. If only temporary genomic integration is desired, the Excision-only PiggyBac Transposase can be transiently expressed for footprint-free removal of the insert, resulting in reconstitution of the original genome sequence. Figure 1. The PiggyBac Transposon System’s cut-and-paste mechanism. The Super PiggyBac Transposase binds to specific inverted terminal repeats (ITRs) in the PiggyBac Cloning and Expression Vector and excises the ITRs and intervening DNA. The Super PiggyBac Transposase inserts the ITR-Expression Cassette-ITR segment into the genome at TTAA sites.